Solo Oil plc (LSE: SOLO) recently reported success on the Ntoyra-2 appraisal well, onshore Ruvuma Basin in southern Tanzania. SOLO has a 25% stake in this project, and given recent success, it could be that it proceeds to commercial development. SOLO is an oil and gas investment company specifically focused on acquiring and developing a diverse global non-operated portfolio of assets. Its strategy in focusing on asset quality in emerging regions, without taking on the risks associated as an operator, assists in simplifying the group’s investment fundamentals. It should be noted here, that the stock is a speculative stock operating in a high risk environment and investors should seek professional financial advice if considering this company for their portfolio. SOLO’s CEO Neil Ritson, has spent 40 years in the energy sector, including as Founder and Chairman of VE Resources Ltd, where he oversaw the rapid growth of the company in the oil services sector. As shown below, the company offers geographic diversification and exposure to emerging oil and gas regions such as the highly infrstaructured Tanzania, which is the largest energy resource in East Africa. Natural gas resources of over 55tcf of probably contingent resources have been discovered in Tanzania, mostly offshore, with the likes of Shell and Statoil taking major positions. SOLO is a first mover in the energy sector, having invested in the country since 2010. The company is only one of a handful of companies so far deriving revenue from gas in Tanzania, via its 7.175% stake in the Kiliwani North gas development. Given its time in the country, it has well established relationships with regulatory bodies and an understanding of the processes that need to be addressed in terms of moving from exploration to production, which should put the company in good stead as it looks to develop the Ruvuma Basin gas discovery over the coming years. Ruvuma: a possible company maker? Ruvuma PSA is shaping up as one of the most promising assets in SOLO’s portfolio even though it is only at the exploration and appraisal stage. As stated, this is an early stage play for the company, so investors should take a cautious approach to their investment decision and take all publicly availalable information into account. SOLO holds a 25% interest in the Ruvuma Petroleum Sharing Agreement in the south-east of Tanzania, covering an area of approximately 3,447 square kilometres of which approximately 90% lies onshore and the balance offshore. 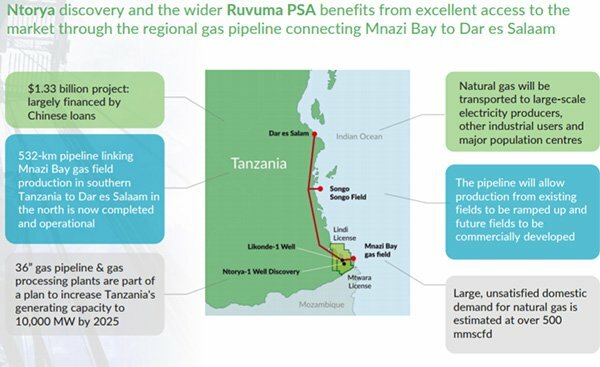 The Ruvuma PSA is in a region of southern Tanzania where very substantial gas discoveries have been made offshore in recent years and where gas has also been discovered onshore and along the coastal islands at Ntorya, Mnazi Bay and Songo Songo Island. 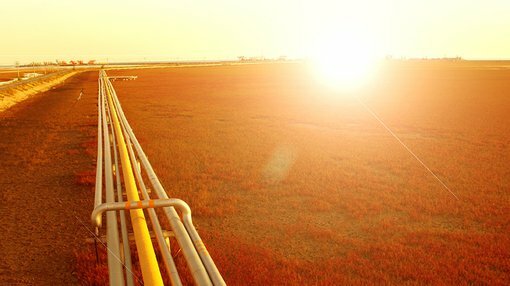 The Ntorya gas-condensate discovery, made in 2012 and operated by Aminex plc, represents the most immediate commercialisation opportunity in the Ruvuma PSC. The Ntorya-1 well was flow testing over a 3.5 metres zone at the top of the gross 25 metre gas bearing interval produced at a maximum gross flow rate of 20.1 million cubic feet per day (“mmscfd”) and 139 barrels per day (“bpd”) of 53 degree API condensate through a 1- inch choke. The well is currently suspended as a discovery for subsequent additional testing or production, and an early production scheme involving local use of the gas or its conversion to power is under consideration. Based on an infill 2D seismic programme around Ntorya-1 a re-estimation of the discovered and prospective resources in the Likonde-Ntorya area was made and subsequently audited by Senergy (GB) Limited who issued a Competent Person’s Report in May 2015. LR Senergy estimated that Ntorya contains a gross 158 bcf of proven gas in place, of which it attributes a gross 70 bcf as best estimate contingent resources. Overall in the Ruvuma PSA, LR Senergy estimates gross 4.17 trillion cubic feet (tcf) of discovered and undiscovered gas in place. Contingent resources are expected to be converted to reserves once a commercial development and export scheme is approved. 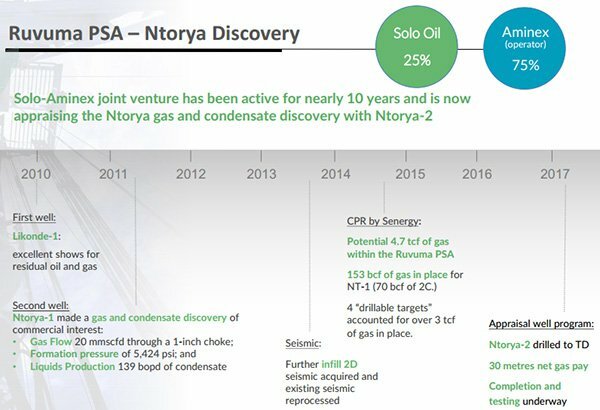 On March 8, SOLO confirmed that the Ntorya-2 appraisal well had been successfully flow tested and suspended for future gas production. At a drilling depth of 2,593 metres, the well encountered a gross gas-bearing reservoir unit of approximately 51 metres thickness. This reservoir section was associated with significant gas influx during drilling and the reported pressures were higher than expected. The well was tested over a gross 34-metre zone, interpreted as dry gas pay, for a total period of approximately 7 days through a variety of choke sizes; not exceeding 40/64-inch. In order to preserve reservoir integrity and in view of the pressures, flow was limited by the choke and during the test the well flowed dry, high quality, gas at an average stable rate of 17 mmscfd (approx. 2,830 boepd) through a 40/64-inch choke. Strong pressure recovery occurred in all instances during the well test build-up periods. Aminex has also reported that mud invasion during the drilling of the reservoir may have caused some formation damage and have tempered gas flow rates. According to the interpretation of the wireline logs, Ntorya-2 encountered the equivalent reservoir section seen in the Ntorya-1 well at a depth approximately 74 metres shallower. No formation water was produced during the tests. Aminex believe that the absence of water on test confirms the previous interpretation that the Ntorya-1 and Ntorya-2 area contains a substantial volume of gas in place. Following receipt of further analysis Aminex will be able to revise their estimates of in-place gas volumes. Several wells will be drilled and seismic data will be collected over the next 12 to 18 months, but in coming weeks there could be some share price catalysts as the company updates resource numbers. The Ntorya-2 well encountered the reservoir at a shallower depth in the structure and condensate was not observed. The fluids recovered down-dip at Ntorya-1 showed a higher condensate-gas ratio and this suggests some fractionation of fluids with depth, further suggesting an extensive gas column is present within the Ntorya gas-condensate accumulation. Ntorya-2 also encountered traces of oil in the gross reservoir interval. Aminex is updating the basin model to determine the optimal drilling depths and locations for future development wells. It is anticipated that following a complete interpretation of all the data from the well, Solo and Aminex will apply for a 25-year development licence over the Ntorya appraisal area. Ntorya-2 will be suspended, as was Ntorya-1, as a future production well. A forward work programme, including perhaps acquiring 3D seismic data and drilling further appraisal/development wells is expected to lead to a gas development of national significance and Ritson highlighted that as well as being a highly significant well result for SOLO and its partner Aminex, it represents an important development for the United Republic of Tanzania. SOLO made considerable progress in the first half of fiscal 2017. An important development in the six months to September 30, 2016 was the negotiation of a Gas Sales Agreement (GSA) with the Tanzanian Petroleum Development Corporation (TPDC) for a price of US$3.00 per mm BTU. In April 2016 SOLO’s Kiliwani North-1 project, the subject of the gas sales agreement, produced its first gas and maiden revenues have subsequently been generated. Gas produced flows through the 2 kilometre tie-in pipeline from KN-1 to the Songo Songo gas processing plant and via a 36 inch pipeline to Dar es Salaam where it is used for domestic, industrial and power generation. Looking at the broader picture, Tanzania is estimated to have more than 55 Terra cubic feet of probable contingent resources, mostly located offshore, representing the largest energy resource in East Africa. The following graph demonstrates the increasing gap between supply and demand, particularly out from 2018/19, creating a strong macro environment for the likes of SOLO. It should be noted here that demand and prices do fluctuate and caution should be applied to any investment decision here and not be based current demand alone. Seek professional financial advice before choosing to invest. The condition precedent for further acquisition of project equity by SOLO was the negotiation of a gas sales agreement which as mentioned was achieved in January 2016. The subsequently agreed tranche milestones were the commencement of gas production which was achieved in April 2016, the receipt of first cash revenue and the declaration of commercial (post-commissioning) gas production under the take-or-pay arrangements of the GSA. With the first of these milestones having been achieved, SOLO increased its direct participation from just shy of 6.2% to 7.175%. SOLO has elected not to increase equity in KNDL to 8.425% in order to focus on investments in the Ruvuma PSC. The Company retains the option to increase its KNDL stake by a further 1.575% to 8.75% when commercial operations are officially declared. In 2014, SOLO acquired a 10% interest in a special purpose company, Horse Hill Developments Limited, which became the operator and 65% interest holder in two Petroleum Exploration and Development Licences, PEDL 137 and 246, in the northern Weald Basin between Gatwick Airport and London. The PEDL 137 licence covers 99.29 square kilometres (24,525 acres) to the north of Gatwick Airport in Surrey and contains the Horse Hill discovery and several other exploration leads. PEDL 246 covers an area of 43.58 square kilometres (10,769 acres) and lies immediately adjacent and to the east of PEDL 137. As a backdrop, the Horse Hill-1 well commenced drilling operations in September 2014 and reached total depth at 8,870 feet MD in November 2014. Evaluation of electric logs and other data collected from the well resulted in the announcement on 24 October 2014 of a conventional Upper Portlandian Sandstone oil discovery. Subsequent analysis of the Kimmeridge, Oxfordian and Liassic sections in the well indicated that there was also substantial in place oil in the naturally fractured Kimmeridge Limestones and associated mudstones. Approval for the testing of all three oil bearing zones was granted in late 2015 and the tests commenced in early February 2016. Tests led to naturally flowing oil rates of the Kimmeridge Limestones at a gross rate of 460 bopd from the Lower interval and 900 bopd from the upper interval. The Portland Sandstone was placed on pump to stimulate flow and achieved a maximum gross stable rate in excess of 320 bopd. These flow rates substantially exceeded the expectations for the well and rank alongside some of the highest rates ever achieved on test for any UK onshore well. Following the testing of the Portland Sandstone, when higher productivity and a lower than expected water cut were observed, further analysis of the electric logs has led to a 200% increase in the anticipated gross oil in place at this stratigraphic level. Previous estimates of oil in place within the Portland Sandstone were 7.7 mmbbls per square mile and were increased to 22.9 mmbbls. 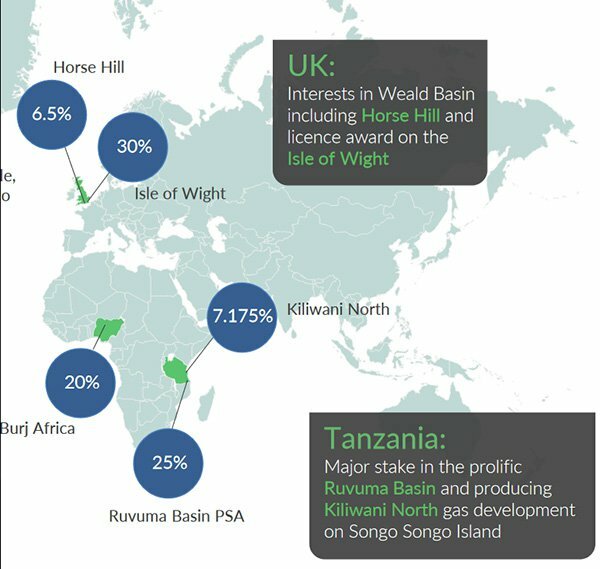 Further long-term testing of the Horse Hill-1 well is planned for 2017 and consequently, this is also a ‘watch this space’ part of the story with the potential for further share price catalysts to emerge. Although it should be noted that any further catalysts are speculative at this stage and should not be taken as guaranteed. Investors should seek professional financial advice for further information.